Connect one (1) keg coupler and flush one beer line. Comments: The text states that it is Garden Hose Thread (GHT). 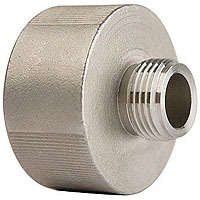 Standard (US) garden hose thread is 3/4" with 11.5 TPI. This is actually 7/8-14 which is the same size used on the Sanke hose fittings. Had to find a spare sanke barb and nut to make it work. Other than that it works great. Bottom Line: I would recommend this product. © 1999-2019 Cydea, Inc. All Rights Reserved.